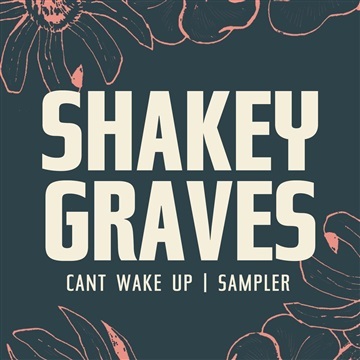 If you think you have Shakey Graves figured out, it might be time to reconsider that claim. His new album Can’t Wake Up breaks down all pre-conceived notions about his troubadour, Americana sound and unfolds a Wizard of Oz-like, dreamy soundscape as the record plays. Alejandro Rose-Garcia, the man behind the moniker, hinted at this new sonic direction by posting on his Twitter in December 2017, saying “Next album. New sound. Sell your suspenders.” Can’t Wake Up is only his second official studio album but already, Rose-Garcia is stepping away from the sound that solidified him as a career artist through the release of 2014’s And The War Came. Can’t Wake Up calls upon various influences of Rose-Garcia’s that are not as readily identifiable in And The War Came: Elliott Smith, Beck, Built To Spill, and other 1990’s and early aughts indie bands. The slightly unsettling overdubs and instrumentation makes the record seem like one cohesive synesthetic dream, with characters coming in and out of focus, extraneous voices singing along with the melody as if they’re lurking just out of sight in the shadows. Enjoy this sampler of tracks from this landmark album.